As young children we wait for the special moment when the Afikoman is slipped into its beautiful bag and hidden for all the children to find. I kept my eye on the prize each and every time only to see that it had been slipped cautiously away from the table sometime during the seder. All the children will giggle in delight upon finding this special piece of Matzo, and will trade it in for a prize or money. 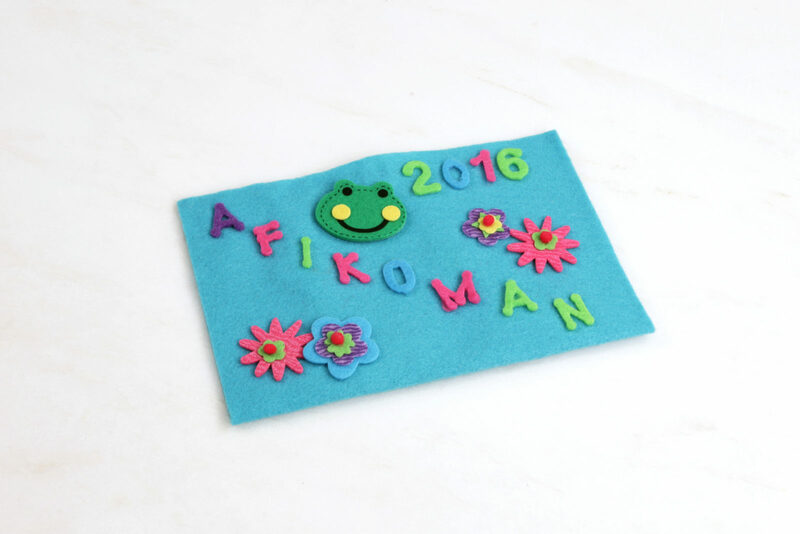 As a kid, my older brother, Laurence, found the Afikoman every year! The hiding of the Afikoman has been passed down generation after generation, and so can this homemade bag. Keep it in the family year after year and pass it onto your children and generations to come! Glue Velcro to middle of top of fabric. Fold over to line up the fabric and glue on opposite side across from Velcro so positive and negative Velcro connect. Cut a 12” x 14” piece of fabric and fold fabric in half so that blank side is facing out. Bead a strip of glue (on the finished side of fabric) along right side of bag from fold up to 1” from the top (the opening). Leave 1” from top of bag free of glue and press down seam. Careful glue is hot! Add a thin bead of glue straight across 1/4” down from top seam on unfinished side of bag and fold over ½” to secure top of bag. Flip over and do the same on other side. Add closure either Ribbon or Velcro. We used approximately 2 feet of ribbon (cut and glued to ½” seam in the middle of bag). You can do the same with Velcro strip and glue to ½” seam. Turn bag inside out and add embellishments to outside of bag such as trim. For the Matzo Bag, cut a 7 x 20” piece of fabric. Fold fabric in half so that blank side is facing out. Bead a strip of glue along right side up to top of bag leaving 1” from the opening free of glue and press down. Careful glue is hot! (make sure you leave 1” free of glue at opening). Repeat on the left side. Add a bead of glue straight across 1/2” down from top seam on unfinished side of bag and fold over ½” to secure top of bag. Flip over and do the same on other side. When glue is dry, turn pouch inside out . Pattern will be on outside of pouch. 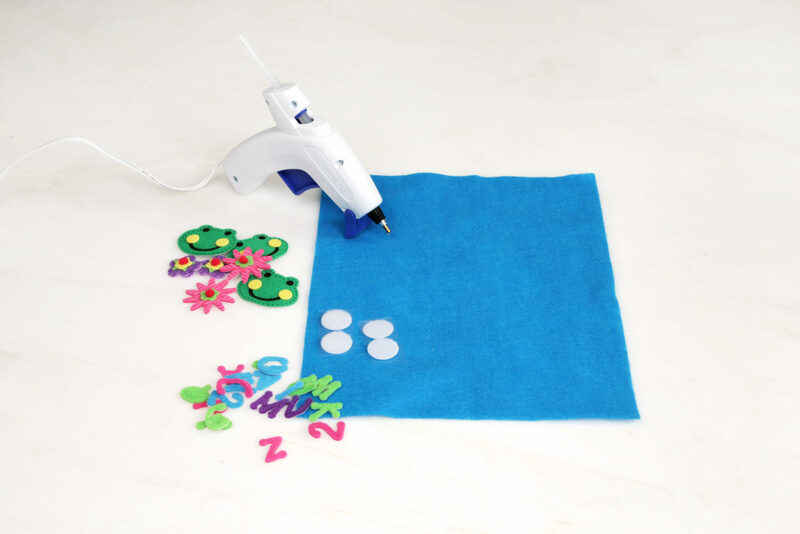 Glue on embellishments and trims. 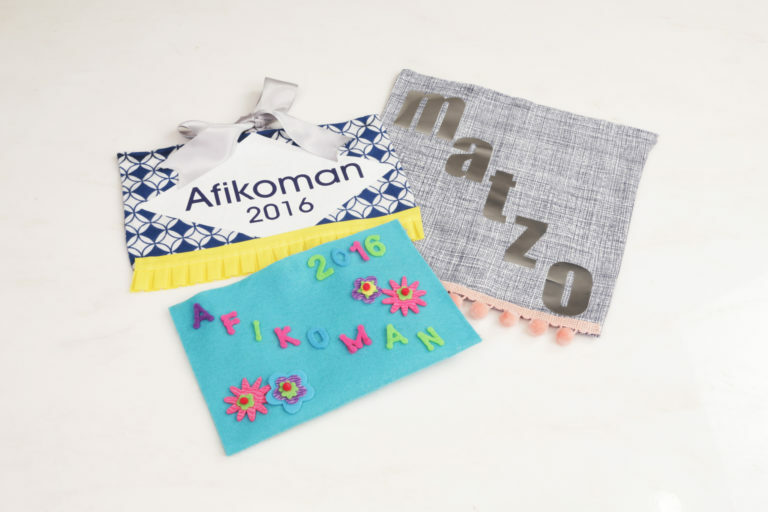 Use the completed bag to hold matzo on your Passover seder table and as a keepsake for years to come.